What makes a chef? 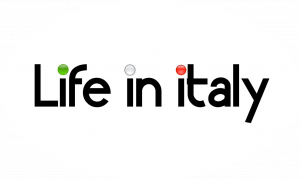 It might be the meticulous care with which an expert like Francesco automatically attends to certain tasks in a manner that few home cooks routinely match. Before he uses watercress for a salad, he takes the time to pick off the leaves like a florist so there will be no stems in the way. He uses the same tactic with the fresh herbs that go into so much of his food, again carefully pulling off the leaves. Once these techniques become habit, it’s impossible to handle food otherwise. Call it pride of workmanship but it’s also what makes for fine cooking. This is a fresh, stylish salad. Pick the leaves off the stems of the watercress and discard the stems. 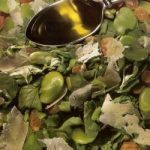 Remove the fava beans from the long pods, place them in a saucepan, cover with water, and simmer 3 minutes. Drain and transfer the beans to a bowl of ice water. Place the raisins in a dish of warm water and set aside to soak for 15 minutes. Peel the skins off the fava beans. Drain the raisins and pat them dry. Arrange the watercress leaves on each of the 4 plates. 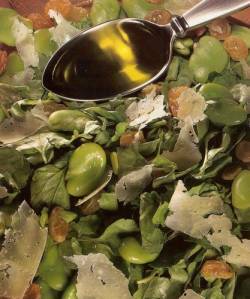 Scatter the fava beans and raisins over the watercress, drizzle with the olive oil, then top with shavings of pecorino.